* Are you working hard, only to reach a ceiling on your wealth? * Are you unconsciously sabotaging your chances of having more money? 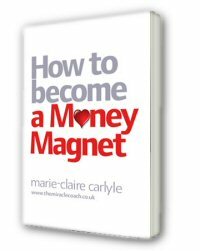 * Each month Marie-Claire Carlyle, author of the best-seller “How To Become A Money Magnet” shares with you the secrets to attracting money into your life. “Its not about the money!” I hear you exclaim … and you are right. Its not actually about the money. Its about your level of self worth and the value you are giving out to the world. Its about who you are in each present moment. Its about living a life a life that’s actually worth living and that is full of juice, of love and excitement. Most people are distracted from who they are by the pursuit of money. They don’t grasp that the money flows in when we really ‘get‘ who we are and what we are up to in this world. Pretending to be small is that the trap that we can all fall into. Having left a highly paid position as Sales Director, I retrained and became a Feng Shui consultant and Performance Coach. I went from leading a high powered team supported by the structure and safety of a reputable organisation to working predominantly on my own from a computer at home. I worked hard and I achieved some success, but it often felt exhausting, and money became tight. “No worries, I am a Money Magnet”, I reassured myself, wondering how much I really believed the statement and questioning my own authenticity for having written a book on the subject. I remember returning from two weeks away in London, putting my card in the cashpoint, and gasping as the balance came up on the screen. I was £2500 overdrawn! “How had that happened?” went through my mind plus a few unmentionable expletives! Remembering my standing as author of ‘How to become a Money Magnet!‘ I declared out loud “I am now creating £2500!”. There was no uncertainty. My voice was loud and clear. I knew that I needed to attract that money immediately. I couldn’t be with being in debt. It wasn’t who I saw myself to be….and I went to sleep that night confident that the money would come in. The next morning, around 10.15am, my phone rang. It was a mans voice. He introduced himseelf as Steve, a successful businessman who was looking for a Miracle Coach to work with to get him to the next level of success. We enjoyed a lovely conversation, at the end of which he kickstarted a year long coaching contract with me by transferring £2500 directly into my account. “Bingo! I am a Money Magnet!” The gap had been filled as if by magic and I was back on track. Yet, what I didn’t realise at that point was that there was something missing. Fortunately like every good coach or mentor out there, I also receive coaching support. (It is essential that any coach you employ also works with a coach or mentor in order to continually advance their game, and thereby yours, and in order to be truly authentic in what they do). And so I am sitting with my coach, feeling bored . She is talking about how we are at the root of everything that is created in and around our lives … and Im thinking “Yeh Yeh, I know this stuff. Ive been teaching and coaching it now for years”. Fortunately I can now recognise my resistance when it comes up and so I sit bolt upright in my chair, and then choose to lean forward so that I can better concentrate on whayt she is saying. I concentrate so hard, as though my life depends on it…and then she says something, and the penny drops..
She says to me “There is no magic in it”. “Hold on a minute,” I say to myself, “I am the Miracle Coach. I believe that anything can happen. When I declare £2500 it arrives. Is that not a form of magic?” and the voice in my head continues, “So if its not magic, what is it?” My coach is continuing to talk about how I am causing my life, and I realise, with awesome clarity, that what I have been missing is an acknowledgement of who I am and the role I have had to play in my life. A cascading waterfall of memories flood my mind. I remember the time when I secured a six figure income for the first time. I rememer the courage I showed to hold out for what I wanted in past pay negotiations, and I recall the moment when I sat down to write and complete my first book. It was me all along” I realise. I had been attributing much of my success to the Law of Attraction without ever acknowledging who I had been and my role in my life’s success. She was lit up, inspired and excited about life! She was standing in her true power. She was standing in her role as creator of her life and the money in it….and I finally got who I am. I am someone of value who delivers huge value to others through my speaking writing and coaching. I am now attracting a team of people around me , including that of Hay House, my publishers who will help me to spread the word worldwide. I am supporting other would be authors who have their own hugely valuable message to share with the world … and I am happy in who I am , at last. Like many people I have worked in the corporate environment and earned the wage. Like many others I’ve ventured out on my own as a self employed entrepreneur. But all along, there was a voice in my head, telling me that I just wasn’t good enough. For whatever reason, and the reason doesn’t really matter, I felt that I had something to prove before I could be really happy. Now I know that that is not true. I am who I am. And who I am, is great! And anytime I start to think otherwise I simple remind myself to remember just who I am. I am not ‘that whinging poor me’ or ‘dominant controlling person’ that I think that I am in the moment. I am so much bigger than that. I am the world I live in. I am the space of creation. I am you and you are me. I choose my life and I choose one that reflects the huge opportunities. Now that I know who I am, I no longer choose to play small. Do you know who you are? I invite to consider that you are reflection of me. You are bigger than you can ever imagine. Your dreams are only the start of who you can be. The world is yours to choose the life of your dreams. Accept your full value as a human being and you will always be a money magnet. Why wouldn’t you be?